Welcome to Teaser Tuesday, the tantalising blog series where I share snippets from works-in-progress, up-coming releases and published novels. Except on the days when I invite good writing buddies to fill in for me, like today! What a thrill it is to have Anna Campbell returning to Teaser Tuesday. Those of you who’ve been following my blog and social media for a while will know what a fan of Anna’s work I am. Her Regency romances are wonderful, loaded with great characters and filled with passion. I’m a particular fan of her novellas. They might be short but those babies sure pack emotional punch. Here’s Anna to tell you about her newest release, Tempting Mr. Townsend. Can’t wait to get into this one. It sounds fab. Oh, and make sure you read the post to the end. There could be a giveaway. Hi Cathryn! Thank you so much for having me as your guest today. I always love visiting your blog and I think a book called Tempting Mr. Townsend fits a spot called Teaser Tuesday to a T! I had huge fun writing my second Dashing Widows book, Tempting Mr. Townsend, especially its rough, gruff, heart-of-gold hero Anthony Townsend who comes from the wrong side of the tracks compared to delicate Lady Fenella. This is a bit of an opposites attract/Beauty and Beast story – two of my favourite tropes in romance. I love watching two people who start out with apparently nothing in common gradually reach an understanding as they fall in love. This novella begins as a road trip to find two runaway schoolboys, but by the time we get to the excerpt, the boys are safe, but Fenella isn’t so sure that her heart is! The scene takes place in the library of Anthony’s newly acquired estate, the Beeches, on the night after their arrival. “Will you?” Anthony asked softly. He’d always intended to pursue her, but her confession of a weakness for him invited a more overt wooing. She was a grand little fighter, but he doubted she’d win when Anthony Townsend allied with her own desire against her. “What is it?” Annoyance roughened her voice. “I’ll scream,” she warned, trying to slay him with her disapproval. Unfortunately for her, he found her spirit arousing. This close she smelled like a flower garden in spring. He drew that glorious scent deep into his lungs. “I dare you.” One hand pressed her shoulder against the door while the other caught her chin to hold her still. Not that she was struggling. Which was dashed interesting. “You are the most provoking man,” she muttered. “Well, really,” she gasped before his lips stole her breath away. You can read a longer excerpt and the blurb on my website. Tempting Mr. Townsend is only 99 cents on Amazon! Why not grab your copy today? Instant gratification could be yours. Visit Amazon, Barnes & Noble or iBooks. Two people who comment today will win a Kindle download of Tempting Mr. Townsend. No geographical restrictions. I’ve told you that one of my favourite themes in a romance is Beauty and the Beast. What’s yours? Fish out of water? Friends to lovers? Cinderella? Secret baby? Cowboys? Sheikhs? Billionaires? There’s so many of them and they’re all great! Let’s talk classic romance tropes today on Teaser Tuesday. Please Note: Giveaway closes midnight Friday AEST, 18th March, 2016. Open internationally. That’s TWO BOOKS UP FOR GRABS, dear readers. So get commenting and good luck! This entry was posted in Teaser Tuesday and tagged Anna Campbell, Australian Authors, Australian historical romance authors, Australian romance authors, Australian Writers, book giveaway, Cathryn Hein, giveaways, Historical Romance, Historical romance authors, Regency romance, Teaser Tuesday, Tempting Mr Townsend, Tempting Mr Townsend by Anna Campbell on March 15, 2016 by Cathryn Hein. Welcome to Teaser Tuesday, the tantalising blog series where I share snippets from works-in-progress, up-coming releases and published novels. Unless I’m feeling lazy and invite good writing buddies to fill in for me, like today! I’m very excited to show off a sample of historical romance author Anna Campbell’s new Regency novella. Not only do I adore her books, she’s huge fun at writerly get-togethers and is always up for a glass of fizz, which makes her very much my kind of person. Anna has won the Australian Romance Readers Awards Favourite Australian Romance Author so many times I nicknamed her the Romance Queen. A title. I must say, she wears magnificently. Anyway, enough of me. Here’s Anna to tell you about her new release. This one sounds a hoot. Make sure you read to the end. There might be a special giveaway. Hi Cathryn! Thank you so much for having me as your guest today. Usually I’m drooling over the recipes on Friday Feast on your blog – it’s nice to be here for the low-calorie Teaser Tuesday spot! Snerk. Which doesn’t mean I plan on delivering one of those tasteless low fat cheese kind of teasers. No, this one’s as full-blooded and swashbuckling as my hero in A Pirate for Christmas, my seasonal novella this year. Actually Rory Beaton, the new Earl of Channing, isn’t a pirate – gossip just paints him as one. He is, however, neglecting his duties as lord of the manor and redoubtable vicar’s daughter, Bess Farrar, beards him in his den to point out his obligations – and to get permission to borrow his donkey for the annual nativity play. Cue entry of mischievous donkey Daisy who was a lot of fun to write. Now, she really does have a pirate heart! Here’s the first meeting between Rory and Bess – and if you catch a whiff of classic British comedy To the Manor Born, your nostrils are not deceiving you! “If you leave a note, I promise to deliver it,” the man said. Bess’s lips firmed as she shifted to find a comfortable spot on the unforgiving seat. The noble Earl of Channing didn’t want visitors settling in. Indications were that he didn’t want visitors at all. Too bad for the noble Earl of Channing. “So he can ignore it, the way he’s ignored my other correspondence?” she asked sweetly. At least Bess assumed that the disheveled auburn-haired man who crashed through the door at the other end of the hall must be Penton Abbey’s elusive new master. He stalked past her, brandishing a sheaf of papers. “That blasted Farrar besom is hounding me again, Ned. I thought I asked you to put her off.” His Scottish brogue added an exotic edge to his heated remarks. He didn’t see her as his long stride ate up the tiled floor. It would be hard to make out an army in this gloom, especially with the sky darkening for snow. “Rory, for heaven’s sake,” the other man stammered, casting Bess an embarrassed glance. “Oh, hell,” he muttered, staring at her thunderstruck. He looked as shocked as if one of these iron-hard oak chairs had stood up, bowed and asked him to dance. A Pirate for Christmas is only 99 cents on Amazon! Buy from Amazon.com, Amazon.au and Smashwords. True to the tradition of Friday Feast, which I know this isn’t, do you have a favourite cheese? I must admit to a liking for brie and gouda. I’ve got two Kindle downloads of A Pirate for Christmas: A Regency Novella to give away to people who share their cheesy stories today. Good luck! Please Note: Giveaway closes midnight Friday AEST, 6th November 2015. Open internationally. That’s TWO BOOKS UP FOR GRABS, lovely readers. So get commenting! This entry was posted in Uncategorized and tagged A Pirate for Christmas, A Pirate for Christmas by Anna Campbell, Anna Campbell, Australian Authors, Australian historical romance authors, Australian romance authors, Australian Romance Readers Association, Australian Writers, book giveaway, Cathryn Hein, Christmas, Christmas stories, giveaways, Historical Romance, Historical romance authors, Regency romance, Teaser Tuesday on November 3, 2015 by Cathryn Hein. Hello lovelies, and welcome to another super-tasty edition of Friday Feast. This week, in a not-to-be-missed post, one of my absolute favourite historical romance authors shows off her gorgeous new release, gives you a step-by-step guide to jelly cake bliss, and generously offers a wonderful giveaway. So keep reading! But first, the sigh-worthy saga that is Us Heins Weren’t Meant To Play Golf. At last I’m home from South Australia and have managed to hit a familiar golf course with my own clubs. I was more than a bit fretful that some of Dad’s bad golfing juju might have followed me home and curled its sniggery, meddling self around my clubs but fortunately that wasn’t the case. Thank god. Then again, it could be simply biding its time. The curse is sneaky that way. What is most definitely not sneaky is this week’s Friday Feast guest. She’s a joy! Multi-award winning and best-selling Regency romance author Anne Gracie is an auto-buy author for me. Her stories are charming, fun, emotional and absolute delights to read. If you’ve never tested the Regency romance waters, then Anne’s Chance Sisters series it the perfect place to start. The Autumn Bride and The Winter Bride were completely heart-warming and now book three in the series, The Spring Bride, has hit Australian shelves with US following shortly. It looks another beauty. Check it out. On the eve of the London Season, Jane Chance is about to make her entrance into high society. Haunted by a childhood riddled with poverty and hardship, Jane is determined her own children will never suffer the same; she intends to make a good, safe, sensible marriage. All goes according to plan until a dark, dangerous vagabond helps her rescue a dog. Zachary Black is all kinds of unsuitable–a former spy, now in disguise, he’s wanted for murder. His instructions: to lie low until his name is cleared. But Zach has never followed the rules, and he wants Jane Chance for his own. If that means blazing his way into London society, in whatever guise suits him, that’s what he’ll do. Jane knows she shouldn’t fall in love with this unreliable, if devastatingly attractive, rogue. But Zach is determined–and he’s a man accustomed to getting what he wants. Doesn’t that sound wonderful? I already have The Spring Bride loaded to my e-reader and with a few quick clickety-clicks you could have this charming book too. Try those good people at Booktopia, Bookworld or Angus & Robertson. Or visit Book Depository, Amazon.com, Amazon.au, Kobo, iBooks, Barnes & Noble, JB Hi-Fi, Google Play, Fishpond, Boomerang Books, or your favourite book retailer. All loaded up with some spring goodness? Great. Now get some jelly in your belly with Anne! I made these recently to take to a friend’s birthday party. I was going to make something savoury, but I’ve known this woman since she was 15, so I decided to make something fun and yummy and retro. They proved a big hit. Cup cakes are very fashionable, but for my money these are more delicious and fun. And surprisingly easy to make. The hardest part is getting the jelly at the right texture, and that’s all a matter of timing. And I had to buy a new patty pan tin because Mum’s old one was all rusty. Makes up to 30 or more little cakes, depending how you fill the patty pans. 2) Cream butter and sugar with an electric beater until light and fluffy. Add in egg, a little at a time, beating until well combined. 3) With a big spoon, gently fold in half the flour and half the milk. Repeat until remaining flour and milk is used up. 6) Place coconut into a large bowl. Make like lamingtons — coating each cake in jelly, then rolling in coconut. Pop them into the fridge for half an hour or so to let the jelly set. You can serve the cakes like this or fill them with cream, which is decadent and delicious and as far as I’m concerned traditional. 8) Whip cream. Carefully slice the top off each cake and place large blob of cream on the inside. Replace top of cake. That’s it. When you’ve finished creaming all the cakes, eat the wonkiest looking one — you owe it to your guests to make sure the cakes are fit to be eaten. 😉 Put the remainder in the fridge. Then resist temptation firmly, or else there will be no cakes left! Oh, these are brilliant, Anne! Thanks so much for sharing the recipe. Jelly cakes were such a favourite growing up and you don’t see then often now, certainly not home-made ones, which are the only ones to have. Love the step-by-step instructions too. Very helpful. But of course you’re going to have to work for it. Not very hard though, I promise. Today your task is to choose which cover of The Spring Bride you prefer most and why. So… does the Australian version do it for you? Me? I love the covers of both. They both sing spring, but I have to admit that the US version is the one I like best. Her dress is stunning! So what about you? Reveal which cover you prefer and why and we’ll pop you into the draw to win a copy of The Spring BridThe. Just the thing to enjoy with a cuppa and a sweet jelly cake. Please note: Giveaway closes midnight Tuesday AEST, 2nd June 2015. Open internationally. Rah! If you’d like to learn more about Anne and her gorgeous books, please visit her website. You can also connect via Facebook, Goodreads and Twitter using @AnneGracie, and the totally fabulous WordWenches blog. This entry was posted in Friday Feast and tagged afternoon tea, Anne Gracie, Australian Authors, Australian historical romance authors, Australian romance authors, Australian Writers, book giveaway, cakes, Cathryn Hein, Cooking, cupcakes, Food, Friday Feast, giveaways, Historical Romance, Historical romance authors, Jelly cakes, patty cakes, Recipes, Regency romance, retro recipes, The Autumn Bride, The Autumn Bride by Anne Gracie, The Chance Sisters Series, The Spring Bride, The Spring Bride by Anne Gracie, The Winter Bride, The Winter Bride by Anne Gracie on May 29, 2015 by Cathryn Hein. Greetings, Feasty lovelies, and welcome to a positively cherry-topped Friday Feast. This week we play host to one of my favourite historical romance authors who has the perfect accompaniment for a cuppa. Plus there’s an even more perfect giveaway! Not a lot to report this week from the Us Heins Weren’t Meant To Play Golf trenches. We suffered so much rain on the morning of our ladies open day the event was washed out. With the weekend equally soaked, there was no chance for play. I can only hope that the time off will result in some easing of my current formus horribillus (a dreadful disease no golfer wishes to catch). Now onto my delightful guest! It’s always a pleasure to host historical romance author Anna Campbell on Friday Feast. Not only do I have a major fan-girl crush on Anna and her books, her posts are always hugely entertaining. I fondly refer to Anna as the Romance Queen, thanks to her many awards and best-selling status. And because in person she does have a touch of regality! I’m also very excited to have a copy of her brand new release, A Scoundrel by Moonlight beside me as I type. I’ve loved all the books in Anna’s Sons of Sin series and it’s wonderful to see it continuing on. Can’t wait to get into this one. Doesn’t that sound wonderful? And you can be guaranteed that this will be a highly emotional, passionate and romantic read. Believe me, with Anna you’re in expert hands. Which means you’ll be wanting to buy a copy of A Scoundrel by Moonlight right now. In which case, get clickety-clicking straight over to those good people at Booktopia, Bookworld or Angus & Robertson. You can also purchase a copy from Book Depository. For the ebook, try Amazon, iBooks, Barnes & Noble, or your favourite retailer. Now please give a bow to Queen Anna. Hi Cathryn! Thank you for having me as your guest today. I always love visiting your blog – and this time I’ve got a recipe that is genuinely mine. Last year, I was waiting for a visit from my dear friend and regular Friday Feaster Annie West and I’d decided to make cherry nut cookies, an Australian Women’s Weekly recipe that’s one of my favorites. Sacre bleu, what was I to do when I was halfway through cooking them and discovered that I didn’t have a major ingredient? These lovely little buttery morsels are usually rolled in crushed peanuts before you put the cherry on top. But my pantry was bare of crushed peanuts. As any good writer will tell you, when you’re stuck, improvise. I had a bag of flaked almonds which I keep on hand for apple crumble. The flaked almonds were far too big to sit on the outside of my biscuits. So I decided to try mixing them in with the dough. Worked a treat – as Annie was kind enough to tell me. I’ve since made this a couple of times and I think I actually prefer them to the original. So it’s time to share my recipe with the world. A happy accident is how I’d describe my latest book, A SCOUNDREL BY MOONLIGHT which is out in North America this month. * The Sons of Sin series grew out of a stand-alone proposal to Grand Central Forever in New York for SEVEN NIGHTS IN A ROGUE’S BED. They liked the idea so much, they wanted more of the same with some linked books. So I hastily put together a trilogy about three friends who meet at Eton. In one way or another, the shadow of bastardy looms over Jonas Merrick, Richard Harmsworth and Camden Rothermere, but all three discover their true selves when they fall in love. As I wrote the books, another man loomed larger and larger. James Fairbrother, Marquess of Leath, is mentioned in book 2, A RAKE’S MIDNIGHT KISS, as the villain’s nephew. He plays a much more significant role in book 3, WHAT A DUKE DARES, when his sister forms a scandalous liaison with Harry Thorne, the heroine’s brother. When Grand Central approached me about continuing the series, Leath was the obvious hero to choose. So A SCOUNDREL BY MOONLIGHT was born. Because I love to put my characters through the wringer, I make him fall in love with a woman who threatens everything he’s always wanted. Life as a writer is fun that way. But of course, meeting Nell Trim turns out to be a happy accident for Leath too! Under normal circumstances, their paths would never have crossed. And their clash makes for fireworks. What sort? You’ll have to read A SCOUNDREL BY MOONLIGHT to find out! In the meantime, have fun at afternoon tea with my biscuits. Cream butter and sugar until light and creamy, add egg and vanilla, beat well. Add sifted flour and mix to a firm dough. By hand, mix in flaked almonds until evenly distributed. Roll teaspoonfuls of mixture into small ball shapes. Press half a cherry on top. Put on lightly greased oven trays, allow room for spreading; bake in moderate oven 15 to 20 minutes or until golden. Cool slightly before removing from trays. Makes about 30. *Aussies can order a print edition of A SCOUNDREL BY MOONLIGHT from Booktopia or the Book Depository. If you’d like an ebook, there will be a local edition later in the year, date to be confirmed. Oh, I love the sound of these, Anna! I must admit, I’d much prefer your almond version than the peanut one. While I love peanuts (my mother-in-law makes the BEST peanut biscuits), I reckon almonds and cherries is a much better match. A cuppa and a biscuit, a squishy chair in a patch of winter sun, and A Scoundrel by Moonlight. Sounds like a perfect morning to me. Have you ever had a happy accident – something unexpected that happened and took you in a new and better direction? Maybe you’ve taken a wrong turn and discovered something wonderful, or accidentally hit the one-click buy button on a book or other item you didn’t intend to purchase and serendipitously discovered a gem. Me, I’ve had some gorgeous moments travelling when I’ve gotten lost and found magic. The same with food when I’ve ordered what I thought was one thing only to be served something totally different but also totally delicious (also totally horrid as was once the case with rognons de veau in France *shudder*). Simply share your happy accident with us and you’ll be in the draw to win. Please note: Giveaway closes midnight Tuesday AEST, 12th May 2015. Open internationally. Rah! If you’d like to learn more about Anna and her books, please visit her website. You can also connect via Facebook, Goodreads, and Twitter using @AnnaCampbellOz. You’ll also find her at Romance Bandits. This entry was posted in Friday Feast and tagged A Rake's Midnight Kiss, A Scoundrel by Moonlight, A Scoundrel by Moonlight by Anna Campbell, almond recipes, Anna Campbell, Annie West, Australian Authors, Australian historical romance authors, Australian romance authors, Australian Writers, Biscuit recipes, biscuits, book giveaway, Cathryn Hein, Cherry Almond Biscuits, cherry recipes, Cookie recipes, Cooking, Food, Friday Feast, giveaways, Historical Romance, Historical romance authors, Recipes, Regency romance, Seven Nights In A Rogue's Bed, Sons of Sin, Sons of Sin series, What A Duke Dares on May 8, 2015 by Cathryn Hein. Hello Feasters! What a fiiine Friday we have today, not least because my beloved Sydney Swans are now perched atop the AFL ladder. They look so pretty there, in all their red and white plumage. Fingers crossed they stay there, although it’s still a long way until finals. As for Us Heins Weren’t Meant To Play Golf news, I’m not sure I want to talk about it, really. I was playing rather well, then… sigh. The Curse. I will never shed it. But the game keeps me coming back. Sucker. Enough of that. It’s a fiiiine Friday because we’re hosting a wonderful guest this week on Friday Feast: award-winning historical romance author Christina Brooke. Rah! Christina was the first Australian to win a Romance Writers of America Golden Heart Award for the manuscript which became her first published novel. From that point there’s been no looking back. Christina has gone on to be a best-seller and been nominated for a prestigious Rita® Award (the romance world’s equivalent to an Academy Award). Her Regency novels are a delight. I adored her Ministry of Marriage series but Christina is excelling herself with the Westruthers. The series began with London’s Last True Scoundrel, continued with The Greatest Lover Ever (aren’t these titles brilliant?) and now we have The Wickedest Lord Alive. Check his abs … er…*cough* I mean this excellent book out! Years later, Steyne has nearly forgotten about his runaway bride. But when he suddenly finds himself in need of an heir, he has no choice but to track her down. Living happily in a small village under an assumed name, Lizzie is surprised to see her husband—and to feel such a strong attraction to him. But she is downright shocked when he asks her to bear him a son. How can they possibly repeat the heated encounter of their ill-fated wedding night without falling hopelessly in love? Believe me, you’ll have a wonderful time with Steyne and Lizzie, so grab Christina’s new book today. Try Booktopia, Bookworld, Bookdepository, Amazon, Angus & Robertson, Barnes & Noble, Boomerang Books, Fishpond or your nearest bookshop. For the ebook, visit Amazon, iBooks, Kobo, Google Play, JB Hi-Fi, Barnes & Noble, or your favourite ebook retailer. And now, if you can drag yourself away from Ab-Man above, here’s Christina! Thanks so much to Cathryn for having me here today on Friday Feast! It’s winter in Australia and of course, my thoughts turn to those beautifully warming dishes we all enjoy when it’s cold. Curries, roasts, lasagnes, apple pies and chocolate puddings— and all of the meals I grew up with. The ones that warm not just the belly but the heart. My mother is a great cook, capable of fancy schmancy dinners and fiddliness that I can only watch with open-mouthed awe (open-mouthed in the hope she feeds me some of that delicious food!) But for general everyday cookery and baking, the Margaret Fulton cookbook was always her guide. When I left home and began to amass my own collection of cookbooks, I have to say that Margaret Fulton didn’t cross my mind. I gravitated towards Marie Claire and Jamie Oliver, Nigella Lawson and Bill Granger. Something changed, however, when I started cooking for my family. I began to get nostalgic for the dear old Strog (Beef Stroganoff, for the uninitiated) and basic staple recipes like baked custard and coffee cakes. My mother’s ancient copy of Margaret’s book is still in use but I was lucky enough to receive my mother-in-law’s, so well-worn as to be coverless and practically in bits. Still functional, however, luckily for me! I’ve just looked at the original publication date of this copy—1968. Not much rocket or kale or quinoa in this book! The dishes range from hors d’ouvres to pastry, from cocktails to Chinese food (very exotic at that time!) and from how to cook a simple steak and make accompanying sauces to traditional Christmas cooking, to a full-blown dinner party featuring stuffed lobster tails or duck a l’orange. Of course there are many dishes that are not terribly fashionable now—angels on horseback, stuffed eggs, avocados with jellied turtle soup, floating island, and so on. But I still can’t go past the Margaret Fulton for sheer comprehensiveness. And using the same cookbook my mother used when I was a child gives me a warm glow of homecoming that is very special. What about you? Do you have a favourite comfort food? Favourite basic recipe book? Join in the conversation for a chance to win a copy of my new release, not yet officially out in Australia, THE WICKEDEST LORD ALIVE! Did you hear that, Feasters? Your chance to win a book that hasn’t officially released in Australia yet. What an opportunity! So crack those knuckles, lay those fingers on your keyboard and get typing. We’re a-waiting all your favourite cookbooks and comfort foods. Seriously, I wouldn’t know where to start with either. I have so many. But I did make an amazing Italian beef and bean recipe the other week. Pulses are so good in the winter. Tis the carbs. As for cookbooks, oh I love them all. But I’m particularly fond of my Rick Stein collection. What are your favourites? Share and we’ll pop you into the draw to win a copy of Ab-Man. Er, I mean The Wickedest Lord Alive. Giveaway closes midnight AEST, 15th July 2014. Open internationally. Rah! If you’d like to learn more about Christina and her books, please visit her website. You can also connect via Facebook, Twitter using @chrstnabrooke and the fabulous Romance Bandits blog. The Wickedest Lord Alive giveaway has now closed. Congratulations to Roz who has won herself a copy of Christina’s wonderful new book. Thanks to everyone for joining in the Friday Feast fun and for sharing your memories. It was lovely, as always. This entry was posted in Friday Feast and tagged Australian Authors, Australian historical romance authors, Australian romance authors, Australian Writers, book giveaway, Cathryn Hein, Christina Brooke, comfort food, Cooking, Favourite cookbooks, Food, Friday Feast, giveaways, Historical Romance, Historical romance authors, London's Last True Scoundrel, London's Last True Scoundrel by Christina Brooke, Margaret Fulton, Regency romance, The Greatest Lover Ever, The Greatest Lover Ever by Christina Brooke, The Wickedest Lord Alive, The Wickedest Lord Alive by Christina Brooke on July 11, 2014 by Cathryn Hein. It’s that day of the week again, the one where we celebrate all things bookish and foody on the incomparable(!) Friday Feast. I’m rather excited about this week’s guest too, because not only does she pen wonderfully warm and smile-inducing books, she’s a lovely lady as well. And, STOP PRESS: She’s a Romance Writers of America RITA NOMINEE! Now onto the also incomparable Anne Gracie! Anne writes GORGEOUS historical romances that truly warm the heart. Her new series features the Chance sisters, with the second The Winter Bride just released. I finished reading the first, The Autumn Bride, only yesterday and can’t tell you the fun I had. Anne’s books make me smile. A lot. Take a look at The Winter Bride. I so, so, so want to read this! Damaris Chance’s unhappy past has turned her off the idea of marriage forever. But her guardian, Lady Beatrice Davenham, convinces her to make her coming out anyway—and have a season of carefree uncomplicated fun. Handsome rake Freddy Monkton-Coombes —pursued by muffins, with a view to marriage — finds himself about to be trapped in an untenable situation by his match-making parents, and pays Damaris to enter into a faux betrothal. But then an accident throws them into a compromising situation, and they’re both forced to reevaluate their position. Will Damaris’s secrets destroy her chance at true happiness? Or can Freddy help her cast off the shackles of the past, and yield to delicious temptation? Seriously, if you haven’t tried Anne then you MUST. Her books are like warm cuddly blankets. You can buy the print version of The Winter Bride now from Booktopia, Bookworld, QBD The Bookshop, Angus & Robertson, Amazon, Bookdepository, Fishpond, Barnes & Noble or your local independent book shop or chain store. Purchase the ebook from Amazon (for Kindle), iTunes, Google Play, Kobo, JB Hi-Fi or your favourite ebook reseller. Time for some fun with Anne. Enjoy! What’s that, you say? Pursued by muffins? Freddy stared gloomily at the plate before him. Lady Bea was convinced that muffins were the Monkton-Coombes food of choice. That was Max’s fault, blast him. He’d told his aunt that Freddy was obsessed with muffins, and of course the old girl thought he meant these blasted bun things. She had him served with them each time he called. And expected him to eat them. With enthusiasm. He picked up a muffin, hefted it lightly and eyed the fire with a narrowed gaze. It was a good blaze, strong enough to reduce a muffin to ash in a short time. But would there be an incriminating smell? He raised the muffin, aimed and was about to toss it in the fire when feminine footsteps sounded in the hall. He dropped the muffin, turned toward the open doorway and saw four smartly dressed females advancing toward him, smiling. The hairs on the back of his neck rose. Why the devil were they grinning at him like that? What did they know? What did they want? He had a powerful urge to flee. So naturally when it came to deciding what food to talk about on Friday Feast, I had to choose muffins. For a long time the only muffins I knew were the kind you toasted. My first experience of the other kind was many years ago when I was backpacking in the USA — I ordered a toasted muffin and coffee for breakfast. 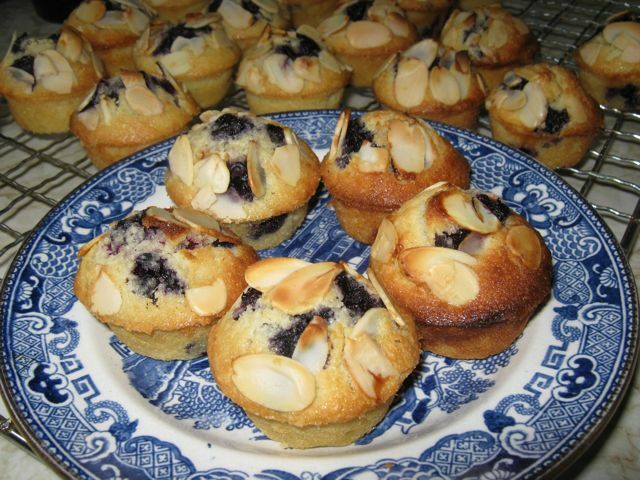 So on with the recipe, and I’m sure there will be a few shrieks because actually it’s a friand recipe and I know a friand isn’t really a muffin, but… well, I made these and they’re yummy and easy and I did cook them in a muffin tray. And they look like muffins. 1) Preheat oven to 180°C. Grease a muffin tray and dust with a little plain flour. 2) Sift icing sugar and flour, add the ground almonds, then stir in eggs and melted butter. Mix until just combined. 3) Stir in half the blueberries. 5) Bake for 15-20 minutes or until light golden. Cool for 5 minutes before transferring to wire racks to cool completely. 6) You can dust them with icing sugar to serve, but I don’t think it’s necessary. * For gluten-free types, I have made these with gluten-free flour and they’re just as yummy. Thanks, Anne! Those friands sound delicious. And healthy, too. Anything with fruit has to be. Just the thing to kick back with a book and a nice cuppa. At the risk of doing another fangirl rave, I loved that excerpt from The Winter Bride. Freddy cracked me up in The Autumn Bride with all his muffin chatter. He sounds such FUN. Oh, we love a generous author on Friday Feast and Anne is no exception. Here’s your chance to win a paperback copy of The Winter Bride. Simply answer this question: What is your favourite thing to have with a cuppa? Reply in the comments and you’ll go into the draw. Giveaway closes midnight Tuesday AEST, 1st April 2014. Open internationally. Rah! If you’d like to learn more about Anne and her books – which you do! – please visit her website. You can also connect via Twitter using @AnneGracie and Facebook. Go Anne in the RITAs! This giveaway has now closed. Congratulations to Tami who has won a copy of Anne’s The Winter Bride. A lovely reading time ahead! Thanks so much to everyone who joined in the Friday Feast fun. I hope you come back again for some more foody-booky goodness! This entry was posted in Friday Feast and tagged Anne Gracie, Australian Authors, Australian historical romance authors, Australian romance authors, Australian Romance Reader Awards, Australian Romance Readers Association, Australian Writers, blueberry friands, Booktopia, Bookworld, Cathryn Hein, Cooking, ebooks, Food, friand recipes, friands, Friday Feast, Google Play, Historical Romance, Historical romance authors, iTunes, JB Hi-Fi, Kindle, Kobo, promo, QBD The Bookshop, Recipes, RITA awards, Romance Writers of America RITAs, The Autumn Bride, The Autumn Bride by Anne Gracie, The Winter Bride, The Winter Bride by Anne Gracie on March 27, 2014 by Cathryn Hein.